Kasuri Meethi Chicken Curry!!! I have taken this picture almost a year back and never post it.. When ever I plan to post this but some how I use to end up posting some other recipe. 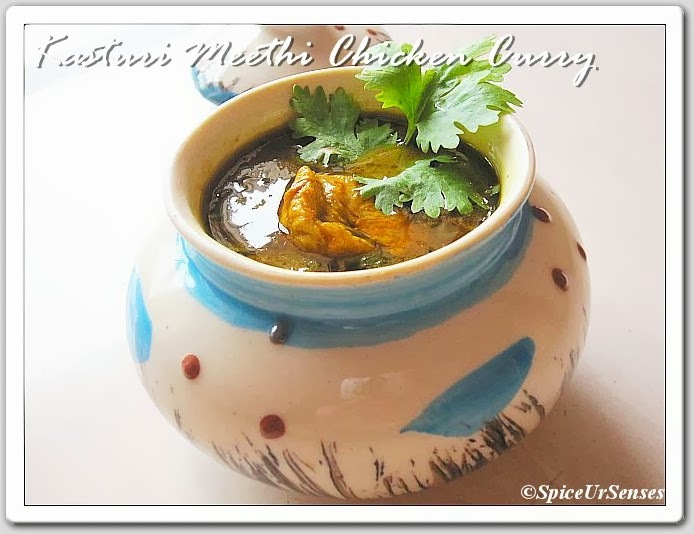 As I'm fully prepared to clear all my draft, so this was the first recipe to come up on my blog..
Kasuri Meethi has lots of medicinal value and I'm not very good at explaining but I know it is very good for health and I always make a point to add few leaves in my veg or non-veg dishes.. I really love the taste of kasuri meethi. This chicken curry is often asked to cook in my family and I'm sure once you people get the taste of it you can't stop yourself cooking this atleast twice a month.. Handful of chopped coriander leaves. In a mixer jar, add all the grinding ingredients and make a smooth paste by adding little water and set it aside. Then add chicken, kasuri meethi, salt and 1 to 2cup of water and close the pressure cooker and cook for 2 whistle on a medium low heat.. Allow the pressure to escape before opening the cooker. Garnish with some more fresh coriander leaves. 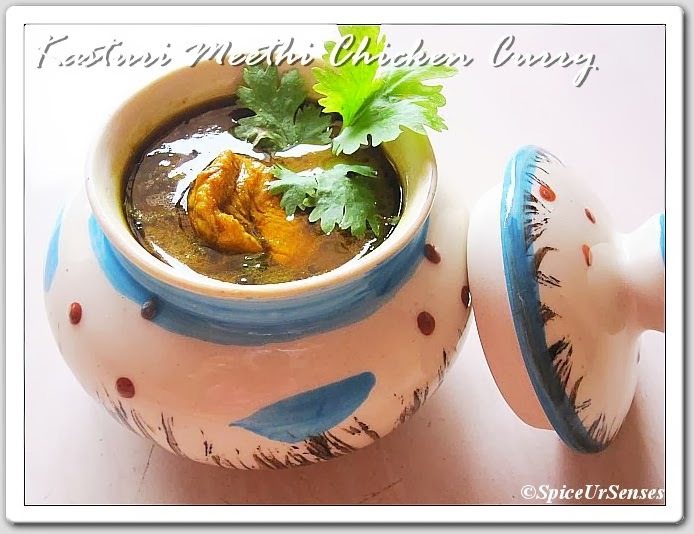 Serve hot with Rice or Roti.. I love the flavor of kasuri methi. 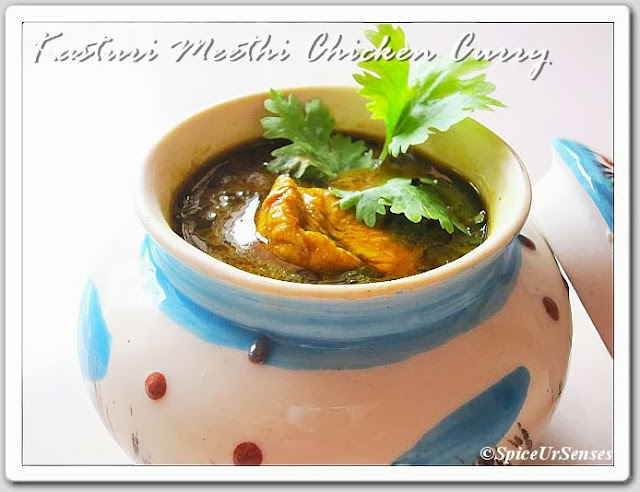 Kasuri methi chicken looks superb. Beautiful click. It makes me hungry.. This curry looks so yummy and tempting. Btw, I like your mixer jar, hahaha.. Delicious and flavorful chicken curry.. Looks tempting! 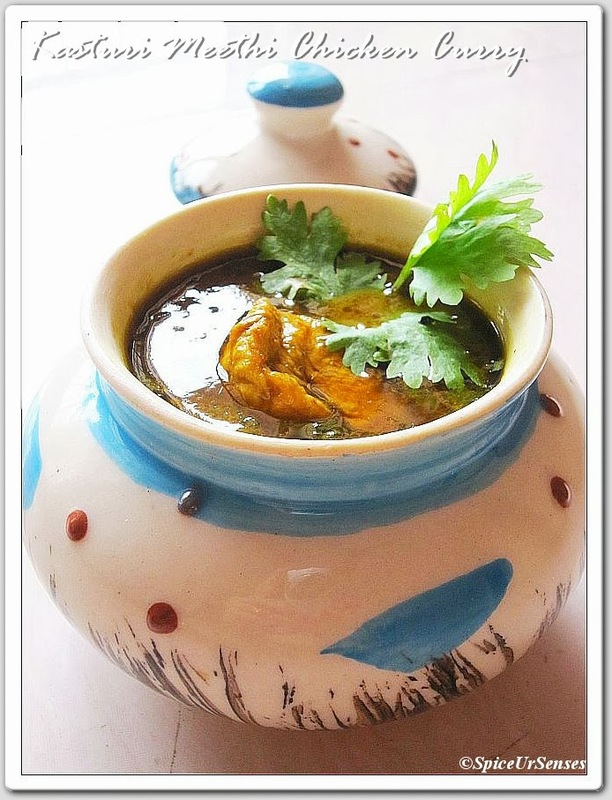 Wat an aromatic dish, love the flavour of dry methi leaves, delicious dish. Lovely clicks ! cute jar !